-This game is being developed as an independent entry that anyone can jump into and understand. It expands and broadens the world of Alan Wake, and contains much more information about the happenings after the first Alan Wake. -Remedy says that the first game was combination of Stephen King and Lost while American Nightmare is in spirit of Tarantino’s From Dusk Till Dawn and Pulp Fiction. -This game takes place away from Bright Falls and now is set in a city in Arizona. The developers wanted to go a classic American Route 66-type of location, and a huge change of pace from the original game. -Wake is in Arizona as he is trapped in the Night Springs television series he wrote when he was younger. The game is said to reflect on Alan boarderlining between reality and fiction, and the thin line Alan Wake is treading and experiencing. Alan goes from episode to episode while caught in a war between light and darkness. -To be released Q1 of 2012, the game is to be faster-paced and more action-focused than the original Alan Wake with it’s digital distribution method in mind. But this does not mean that the game is abandoning atmosphere and story or what makes Alan Wake what it is. -The game is supposed to last for several hours, with bigger replayability than the original Alan Wake. -One unlockable mode is known as, “Fight Till Dawn,” in which players are in an expansive arena and must fight waves of progressively tougher enemies while finding ammo and weapons around the various locations. Players win if they can survive until daybreak. -Remedy confirms this will not be the last Alan Wake game, and that the sequel is definitely coming, but no details or specific release schedules. 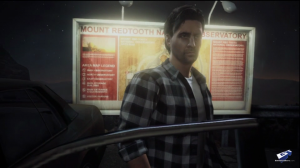 -Remedy hopes they might be able to bring this game and the original Alan Wake to PC, but nothing set in stone quite yet, but there might be some bright news for PC owners in the near future. We’ll bring you more news as it develops.